Lock in a great price for Metropole Bangkok – rated 8.3 by recent guests! Very nice lobby area with coffee at any time. Helpful staff. All staff are very accommodating.. room is also good. The interior decor and the rooms are beautiful. Although the location is a good walk to Sukhumvit, Thonglor road is filled with restaurants and bars making it a great location. Location, comfortable bed, quite place, clean and helpful staff. It’s value for money! They could double the price and people still pay for it. It was my third visit to this property. I like to spend my weekends here. The location is great and the price is fair. Metropole Bangkok This rating is a reflection of how the property compares to the industry standard when it comes to price, facilities and services available. It's based on a self-evaluation by the property. Use this rating to help choose your stay! One of our best sellers in Bangkok! Boasting an outdoor pool overlooking the Bangkok skyline, Metropole Bangkok is a high-rise accommodations located in a convenient area of Bangkok with a private parking area available on site. Free WiFi is accessible in all public areas. Guests can enjoy delectable meals served at the restaurant on site. All air-conditioned rooms here are decorated with luxurious. Each room features a comfortable bed and a seating area at a corner of the room. A flat-screen TV, reading lamps and coffee/tea facilities are provided. The private bathrooms come with free toiletries. Emporium and EmQuartier Shopping Malls are a 20-minute drive from Metropole Bangkok, while Terminal 21 Department Store is reachable within a 25-minute drive. 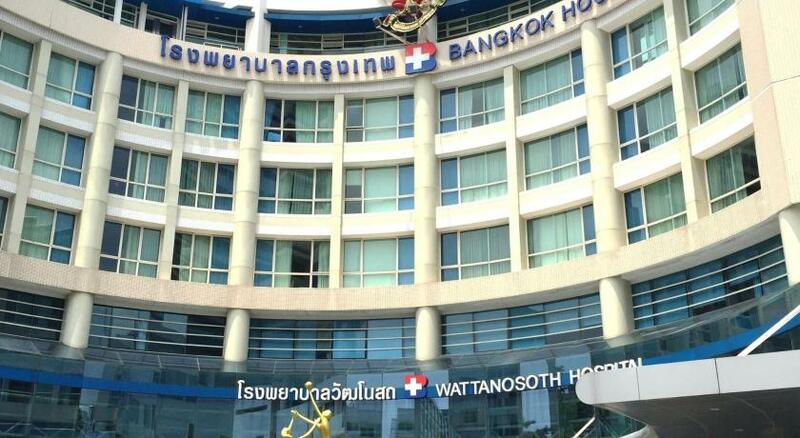 Camillian Hospital is 1,950 feet and Bangkok Hospital is 2,450 feet away. The nearest airport is Suvarnabhumi International Airport, 14 mi from the property. When would you like to stay at Metropole Bangkok? This studio has air conditioning, electric kettle and dining area. This studio features a balcony, toaster and tumble dryer. House Rules Metropole Bangkok takes special requests – add in the next step! Metropole Bangkok accepts these cards and reserves the right to temporarily hold an amount prior to arrival. Very nice hotel but located almost under the highway bridge. Welcoming and helpful staff, very good service, comfortable sleep. The shower! Wish I had seen previous comments about this. I slipped and cut my shin the first time I used it as the shower is VERY slippery. As others say, water goes everywhere due to poor design... housekeeping must be sick and tired as the owners don’t seem interested in fixing this simple problem but can afford electronic Japanese toilet seats?! Bizarre. After I arrived they informed that breakfast was not intact included, place looked dingy, raggedy towels and sheets with holes in them, bathtub was not nice like the one shown in the picture - you couldn’t even take a bath in it, the cleaning staff woke me up from a nap and when I asked if the don’t disturb light doesn’t work, she just said, “Yes, it works, so you don’t want your room cleaned?” Very rude, The gym only has 3 machines and the pool doesn’t have any chairs to lay out on. Not worth the money at all. The location was good for me. It was close to the Bangkok Hospital. I liked the old time feeling of this place, which could have been a 5 star hotel 40 years ago. If you tell the taxi driver the name of the hotel, he says he doesn't know much. I felt sorry for the inconvenience of having to show my address. bathroom always wet after taking a shower. Anoying. the location very near where our training area. The staff is very friendly. Bed is super comfortable and it is a nice looking and clean hotel. The hotel is quite dark in places . At night in the hotel bar we nearly went and got a torch so as to see each other !! The staff at Meteopole were fantastic. Forever smiling and very helpful. The door staff were the friendliest we have ever met and they engaged in conversation with you every time we left or returned to the hotel. Very close to the river taxi pier.. I think it will be great if there is any transportation from the train station.